When all things are broken down to their essence, including art and even life itself, the remaining ‘installation,’ or matter, is “dust.” All things came from dust and to dust all things return. Dust, what it is and what it means, has been a focus in Gleadow’s art making process for the past several years. This process begins a long time before art is ever created. It is a way of life and a way of ‘seeing,’ seeing through the physical world, the pain and chaos into other dimensions, attitudes, and perspectives. The world around us is so full of incredible beauty in the places most people miss. They overlook, avoid, or call bad or ugly what they cant ‘see’ or understand. Colors, textures, materials, juxtapositions, shapes and forms, common objects out of context lost in abandoned worlds…these are trampled on, forgotten, cast out wonders that have no apparent value except to be buried in landfills where future communities will be placed upon devoid of any understanding of what was before and now lies beneath their feet. Every culture has this and China has it in abundance. Gleadow states, “In recent years local communities in Beijing have been in constant flux. Architectures, dwellings, and lives have been deconstructed, pounded into parts, and crushed into dust.” How can we stop the unstoppable or reconcile the irreconcilable? Gleadow does it with his art, by acts of seeing and making. Gleadow recognizes and brings to light the hidden and true value and worth of that which is dismissed and denied. HIs art is, on one hand, brutally ‘in your face reality,’ but on the other hand it is totally honest and built on a foundation of faith, hope unseen, and love of truth. Through reclaiming that which is viewed as worthless; mending the broken, gathering the lost, giving it a name and a place, Gleadow brings new forms to life and new life from the dead. The first thing one sees entering the main gallery space is a large wall size studio floor-calendar titled Dust. It is a confetti-like chronological date book of days and months and years of working in the studio. All of the things normally relegated to the ‘dust bin’ were collected, repurposed, and reused. Shredded drawings, destroyed paintings, common debris, broken bits, sculpture shards, cuttings, droppings, gleanings, and so on, carefully and randomly archived into a giant grid. The way up is always down. Humility is the way to go higher. Brokenness is the way to empowerment. Ladders serve is as literal, and figurative, passageways to higher places but these passageways always mean suffering and self-denial. “Sebastian,” a Second Century Martyr for his Christian faith and often depicted in European classical paintings tied to a tree and shot with arrows, is the title of the ladder sculpture situated in front of the wall mural illustrating the stoning of Stephen, a Biblical figure who also died for his faith in Jesus Christ. The broken plaster chunks came from a found mold of a classical figure most likely used in the art department of a local art school to teach and instruct students in the fine art of representational drawing. They are pure and white but sharp and heavy and resemble the stones of scorn and judgement being hurled at the man in the mural for his beliefs. 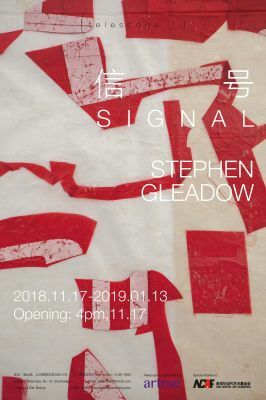 Gleadow’s Signal drawings use found flag, banner, or signage materials whose original purposes are to communicate specific messages and ideas. These materials have been cut up and pressed in sheets of clear cast resin freezing them in a permanent transient state of mis-communication as they twist and turn littering the air with alphabet swarms of sputtering voices and shattered words. “The words are just fragments, abstractions, parts signaling familiar references of their origins,” says Gleadow. There are signals everywhere filling the air in radio and short waves, TV, advertising. Often the messages get garbed through bad internet connections, antenna reception, or language barriers, but their voices travel on and on and on telling their ever changing stories. When I was a young boy growing up in the US, children played a game called “Telephone” where one person would whisper a story into the ear of someone else, then that person would in turn tell the same story to another child, and on and on. By the time this flow of words traveled through the lips and ears and minds of several people it had completely changed and was but an abstraction of its origins, but the stories remained interesting for what they were. These Signal drawings, likewise, transcend language, even the language of meaning. They can be just fascinating and beautiful works of art that perhaps might remind us of many things in our lives. How can one describe a ticker tape parade? What is the language of falling paper? What meaning does it have? Its thrilling…breathtaking…beautiful. That's enough! Poem from the Sea of Bones, the blazing white plaster and wood sculpture surrounded by a deep blue curtain of blueprints in the small gallery, looks like a giant exoskeleton pulled from the Dead Sea encrusted in treasures of minerals and salts. Suspended in its center a charred black bone winds its way geometrically throughout the structure, giving it strength. The bone resembles some kind of ladder upon which the entire body after centuries or millennia finally made its way out of the cold deep up into the air and bright light for all to see. It's a strange and mysterious relic that defies specific scientific classification yet offers us hope, a picture of reclamation. It was a lost thing or being, condemned to eternal darkness, and yet was still not out of the reach of redemption and new life. You might say that Poem from the Sea of Bones is a love poem from the deep.